An approach to reducing stress generated by fighting these “givens” is to reset expectations and to practice a “radical acceptance” of these realities. Abundant social science research demonstrates that dissatisfaction is generated by the gap between expectations and experience. -*How do you deal with life’s “givens” that may not be as you would like? 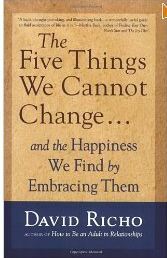 This entry was posted in Behavior Change, Resilience and tagged Behavior Change, David Richo, radical acceptance, Resilience, Work-Life on March 4, 2012 by kathrynwelds.